Our guest author today is Laif Kvarsten. He is eleven and, as you can tell, an avid railfan. We thank him for his contribution. Bright neon signs led us to Portland’s Metropolitan Lounge, where sleeping car passengers awaited the arrival of the southbound Coast Starlight. The small trackside room was adorned with railroad maps and colorful posters, and the sound of a Cascades idling in the yard was soothing. “Passengers for Train 11, all aboard! She’s waiting on Track Number Two.” We were led onto the train by a friendly attendant, and soon found our cozy Superliner Bedroom. As we sat down, we felt a jerk. And we were off. As the whistle blew, we sped through the Central Eastside Industrial District, where graffiti covered crumbling buildings. The train whizzed through Oregon City, and old mill buildings bordered the rushing Willamette. Lush vegetation grew on an island in the river that was home to just a few lucky people. Stately Victorian houses stood beside the tracks, and fields flashed by outside the window. Soon, we arrived at the 1918 Queen Anne depot in Salem, Oregon. As rain fell, the small town of Turner came into view, and a Union Pacific freight train sped past. After passing through Jefferson, Oregon and the pastoral farmland surrounding it, we crossed the Santiam on a graceful span. Misty hills became the backdrop for green fields as we neared Eugene. The sky varied greatly in color, from a deep black to a soft gray to a bright, sunny white. We rolled over marshes on low wooden trestles, and the sun peeked through the clouds as we sped into Eugene, where we stopped briefly. Now the sky was blue and cocktails were being ordered in the Parlour Car. As we began to ascend the Cascades, we saw verdant patches of farmland tucked between blue hills. Cliffs, forests, and valleys whizzed by as we prepared for dinner. 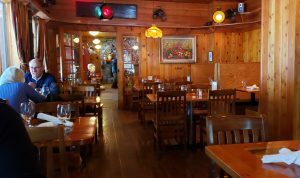 In the Dining Car, the atmosphere was pleasant and my seafood terrific. Snow soon blanketed the mountains, and twilight enveloped the train as a silver moon rose amid the clouds. We began rocketing toward Chemult as the silhouettes of passing trees became barely visible against the dark sky. The next morning, the steady rhythm of the train slowed as we began our stop in Redding. We continued at high speed through the faint early morning light until we approached Sacramento, but nothing could prepare me for what I would soon see. Glistening rivers, welcoming city lights, and tall, sun-washed trees were surrounded by a golden sky that could only evoke hope and optimism. After a short stop at Sacramento’s Valley Station, the train rushed off into the breaking dawn. The clouds had dispersed, and were hovering in abundance at the horizon, where their edges were illuminated by the rising sun. The train tracks cut between the fields that lay in an odd array of shapes and sizes while the sun came into full view, and we soon made our way into the Pacific Parlour Car for breakfast. We enjoyed watching the sparkling blue San Francisco Bay pass by, its edges lined by weathered lumber mills and oil refineries, steam hissing from cracks in their decaying rusty pipes. Branches of eucalyptus trees had become intertwined to form a tunnel that stretched overhead, and we soon rushed into the San Jose metropolis. After a stop at San Jose’s Diridon Station, we quickly raced away from the graffiti-covered fences and billboards of the cities and into the rich Central Valley of California, where farmhands were working in the fields and cowboys herding cattle. Gnarled oaks and California poppies dotted the sun-lit green hills. Strawberries, kale lettuce, cherries, mustard greens and apples all grew together in this fertile valley called America’s Breadbasket. We then entered the Elkhorn Slough, a beautiful swampy waterway near Monterey Bay, populated by geese, herons, pelicans and sea lions. As we proceeded south, we stopped for a short air break at Salinas, where a sign promoted Salinas as “The Salad Bowl of the World”. We continued rolling through the Central Valley and the climate became more arid, allowing mesquite and juniper to prevail. After lunch, we began to descend Cuesta Grade. The train wove its way around hills and through valleys as it cut across pristine meadows and dipped into dark tunnels. As we began to loop around the Southern Pacific horseshoe curve, we were stopped. Not by a freight train as usual; this time it was a cow on the tracks. But soon we made our way down the spectacular horseshoe curve, then crossed a high trestle before arriving in San Luis Obispo, where passengers were permitted to briefly deboard. I chose to observe and record the consist, which is as follows. In ten minutes, we were on our way, winding through agricultural valleys on our way to the ocean. Passengers were socializing over wine in the Parlour Car, and I consulted the map to determine we would soon reach the coast. But once I saw it, I could not bring myself to to take my eyes away from the window. As William Clark wrote of the Pacific, “Ocean in view, O the joy.” The sparkling breakers crashed against sandy cliffs as we crossed a trestle above an isolated beach. The shadows of an old fence that separated the tracks from the ocean grew longer as the sun sank lower in the sky. As sunlight streamed into the Parlour Car, we crossed several other trestles, including Gaviota Trestle. We continued to skirt the ocean until dipping inland and reaching our final destination of Santa Barbara. There, we deboarded and were welcomed by the small yet beautiful Mission style depot. After confirming the consist, I watched the Starlight speed off towards Los Angeles. 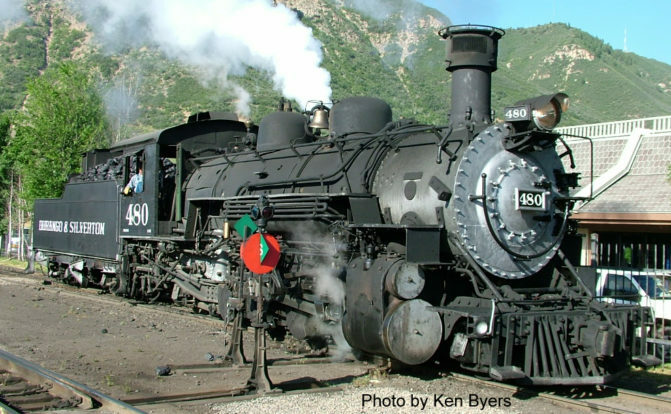 No better place to introduce you to the Oregon Rail Heritage Foundation’s new feature than with one of America’s most famous train rides: the narrow gauge Durango and Silverton. We rode it in early June and were mesmerized by the beauty of the scenery that can only be seen by train or foot, and the classy service that made the day-long ride a pleasure from start to finish. Coming at the end of our first week on the road, we were ready to let somebody else do the driving. Riding behind a K-36 Mikado steam engine (see photo) is the way to go to feel the authenticity of a ride through time. 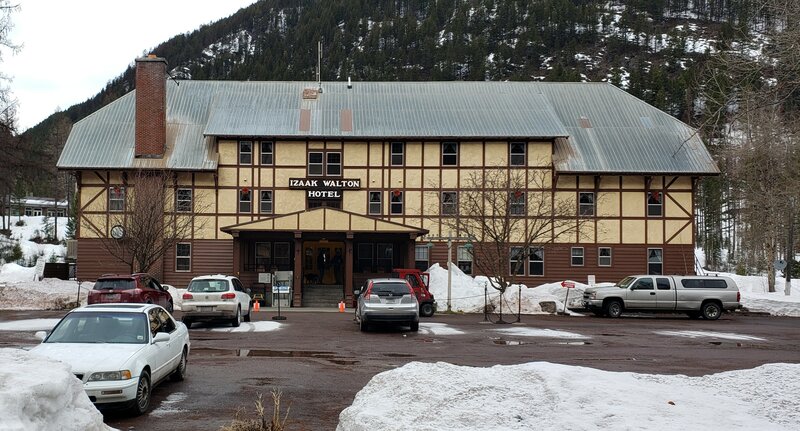 The Durango and Silverton was built in the early 1880’s as a narrow gauge railroad to service the silver mines in the aptly named town of Silverton forty-five miles up the mountains. It was narrow gauge because rails were lighter to handle, and to save money. 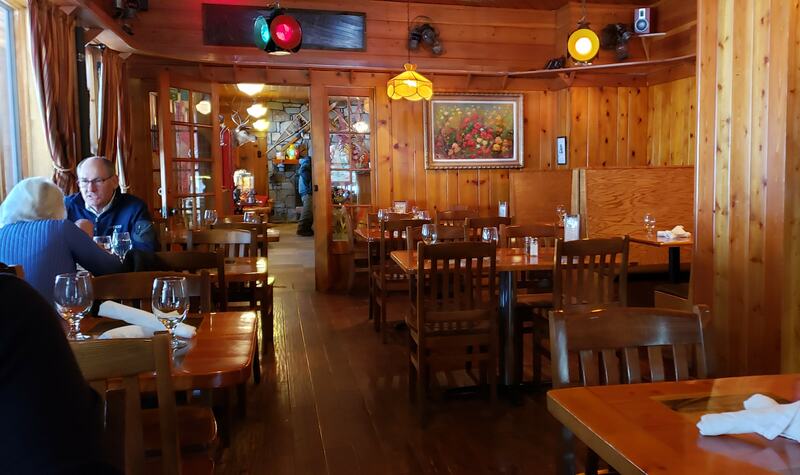 The six-and-a-half-hour trip includes a lunch stop in Silverton that has numerous restaurants to choose from. Plan ahead because at an elevation of 9300 feet walking can become tiring. 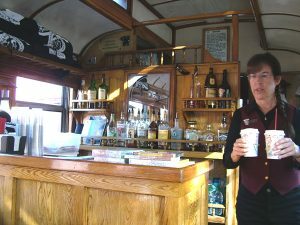 We decided to pay a little extra to sit in the Parlor Car, a beautifully restored vintage rail car (see photo) complete with gleaming woodwork and lots of windows to admire the Colorado countryside. The choice of the Parlor Car proved to be an inspired decision. Instead of bench seats with limited leg room we sat in moveable chairs at small tables. An attendant brought us coffee and other refreshments. She also prompted us to the wonderful photo opportunities on the trip and told us where to aim our cameras. She was also loaded with information on the ride and the history of the railroad. Picking a place to stay in Durango is somewhat limited. The elevation of nearly 7,000 feet is another consideration for some. We decided to stay in Farmington, New Mexico sixty miles away and use it as a base of operations for five days while we saw the railroad one day, Mesa Verde on another, a day at the Ship Rock Native American “flea market,” and still another day trip to Monument Valley in Arizona. Staying in Farmington makes sense money-wise, too. It’s at least a $100 a night less than staying in Durango. Restaurants abound and meals should not be a problem. Train Trips encourages you to share your train trips with us. Contact us at traintrips@orhf.org for more information.